The National government issued a revised proposed National Policy Statement (NPS) on Freshwater Management on Wednesday, responding to more than 9000 submissions on its original proposal in February this year. The Freshwater NPS amended in August 2017 will supersede the original 2014 version as of 6 September 2017. The major controversy over the initial Freshwater Management proposals to make 90 per cent of New Zealand’s rivers and lakes swimmable by 2040, was over the grading system for swimmability, which replaced the old requirement for waterways to be wadeable. The policy now includes all four statistical tests used for determining which rivers are excellent, good, fair, intermittent or poor, and clarifies the risk as <1 per cent, <2 per cent, <3 per cent, >3 per cent and >7 per cent respectively. The revised plan will also require 1000km of waterways be improved to a higher grading each year for the next 23 years, supported by new national environmental regulations governing activities like fencing stock out of waterways and forestry. The new policy also tackles nutrient discharges. It makes explicit that nutrients must be limited to control algae growth and establishes a new process for regional councils to manage instream levels of nitrogen and phosphorus, and requires councils to take action when measures of aquatic life drop below newly specified levels. The $2 billion cost of meeting the water quality improvements will fall on farmers to fence waterways and reticulate stock water, councils in improving their wastewater and stormwater infrastructure, and taxpayers. – more detail on monitoring for freshwater and better processes regarding measuring water quality including macroinvertebrates and nutrient levels in waterways. 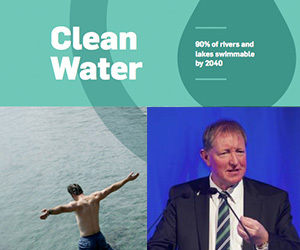 Regional councils now need to show how they will contribute to the overall target of 90 per cent of New Zealand’s lakes and rivers being swimmable by 2040 and to set regional targets for getting there. This includes identifying the lakes and rivers people use for recreation, and sharing what improvements will be made and how they will be achieved. Regional councils will need to report on their progress every five years. There was no legal requirement in the old NPS to improve water quality for primary contact (swimming). The standard was set at secondary contact (wadeable) and was measured as a median of less than 1000 E.coli/100ml. The new policy removes references to secondary contact and focusses on improving primary contact with a median of less than 130 E.coli/100ml. There was a non-regulatory reference to primary contact in the old NPS with two gradings and only one statistical test (95 th percentile) and no sampling requirement. In changing to a regulatory requirement, the new NPS uses five gradings, four statistical tests and requires a sampling regime. There is also a stronger direction to manage nutrients in rivers and their impact on lakes and estuaries. Councils will need to use the Macroinvertebrate Community Index to assess ecosystem health and must take action to improve waterways that are degraded or degrading. RMLA president Maree Baker-Galloway noted that the majority of RMLA’s recommendations made in its submission were carried through into the revised proposal. Following Wednesday’s announcement, the new NPS was gazetted yesterday (August 10). Councils now have until 31 March 2018 to set preliminary regional targets, and until the end of 2018 to finalise their contribution.